Mayors from various cities across the world will be attending a two-day international mayor's forum in Kazakhstan capital Astana on July 2 and 3. This global forum will be inaugurated by the President of Kazakhstan, Nursultan Nazarbayev, and is being held to mark the fifth anniversary of the Belt and Road Initiative (BRI) and as part of the 20th anniversary of Astana becoming the capital of Kazakhstan. The most beautiful birds in Antartic, Emperor Penguins eat a variety of fish but diminishing sea ice in the warming Antarctic means less fish to eat. The tallest and heaviest of all living penguin species, Emperor Penguin, have a varied menu that changes with the season. Berlin [Germany], May 30 (ANI): Recognizing the importance of Vocational Education and Training (VET) towards making a transformational impact in creating sustainable livelihood opportunities for the youth and buildingefficient pool of skilled human resource,India and Germany on Tuesday agreed to further strengthen collaboration in this area. The United States Ambassador to the United Nations Nikki Haley said on Tuesday that Washington believes China is being 'productive' as it is using its channels to stop North Korea from carrying out missile launches. Chinese President Xi Jinping met with Cambodian King Norodom Sihamoni in Beijing on Monday. King Sihamoni is visiting to attend the country's V-Day celebrations on September 3. Xi said China cherishes its traditional friendship with Cambodia and is are ready to maintain high-level contacts with that country in various forms. North Korea's supreme leader Kim Jong-un has dismissed top officials after a standoff with South Korea. According to the New York Times, the standoff began after land mines were planted by North Korea that injured two South Korean soldiers. The two countries, earlier in the week, threatened strikes against each other before reaching an agreement on measures to reduce animosity. South Korea responded by resuming propaganda broadcasts critical of Kim's authoritarian rule for the first time in 11 years. The enthusiastic Indian disapora lauded Prime Minister Narendra Modi post his passionate address and said that he is bringing India on a new level. "We have been looking forward to this event since two months. PM Modi told us that he will provide us with security and stability here, which was very assuring," said an Indian national. "We are excited with his speech. The fact that there will be a temple here in Dubai is something that is great and our community could not be happier with this news," added a Mangalorean residing in Dubai. However, there were a few people who felt that the Prime Minister had not said anything concrete in his speech with regard to providing solutions to their problems. Prime Minister Narendra Modi, who held bilateral talks with his Pakistani counterpart Nawaz Sharif in Ufa, Russia, has accepted the latter's invitation to Pakistan for the SAARC Summit in 2016. Foreign Secretary S Jaishankar shared the information. "Prime Minister Nawaz Sharif reiterated his invitation to Prime Minister Modi to visit Pakistan for the SAARC summit in 2016, which Prime Minister Modi accepted," he said, after the Prime Ministers of India and Pakistan finished their bilateral talks. China's Chairman of the Standing Committee of the National People's Congress Zhang Dejiang on Monday paid tributes to Mahatma Gandhi at Rajghat. Zhang, who arrived in New Delhi late on Sunday night, had earlier met Maharashtra Governor C Vidyasagar Rao and stressed upon strengthening cooperation between the Parliaments and provincial legislatures of India and China. A United Nations report has stated that India's economic growth is likely to surpass that of China with GDP growth expected to touch 7.7 percent in 2016. The report states that Chinese economy is expected to grow by seven percent this year and 6.8 percent next year. Now, a software will provide world-class protection to businesses with fewer than 25 employees, without the need for specialist IT skills, making it easier to focus valuable resources on running and developing the business while keeping operations, customer's and employee's data secure. “All our ground products have been independently reviewed by travellers of varied tastes and so we know we can cater to the range of demand Abacus can channel from all around the region,” added Wladimir Guez, City Discovery Co-Founder and Vice President. “This is a huge opportunity for City Discovery and we look forward to fulfilling every reservation made through Abacus Content Plus.”Abacus travel agents can sell City Discovery products independently, or tie them into a custom itineraryas part of a complete personalized package, with flights, accommodation, car rental, transfers and more. Easy to align and track, Abacus Content Plus automatically creates a consolidated super-PNR. In beta testing now, Abacus Content Plus will be free to use as one of the 60 downloadable Abacus Red Apps that integrate with leading B2B workflow solution, Abacus WorkSpace. 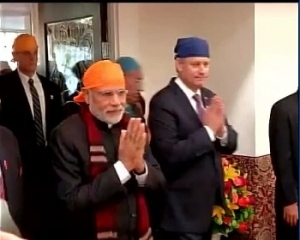 Prime Minister Narendra Modi on Thursday bowed in remembrance to the 1914 Komagata Maru incident, where hundreds of Sikh passengers were not allowed to alight on Canadian soil due to their Asian origin. Women tend to avoid applying forjobs that are "male-sounding"
A new study has revealed that women tend to avoid applying forjobs that are "male-sounding".According to the study by Technische Universitat Munchen, women also feel less inclined to respond to ads containing frequently used words like "determined" and "assertive", as such words are linked with male stereotypes. The study found that if job advertising described a large number of traits associated with men, the women found it less appealing and were less inclined to apply. A new study has revealed that 67 percent of the employees have an affair with their bosses to get ahead at work. According to a survey by dating site Victoria Milan, 42 percent of participants said they have already had an affair with a co-worker or a boss, while 81 percent said they have at least "fooled around", Huffington Post reported. United Nations launches 2014 online courses on Finance, Trade, and Intellectual Property As the demand from Sub-Saharan African countries for online training steadily grows, the number of online courses has increased by 390% over the past 5 years GENEVA, Switzerland,March 1, 2014/ -- The United Nations Institute for Training and Research (UNITAR) (http://www.unitar.org) has just launched the 2014 edition of the online training courses in financial management, international trade and intellectual property. Improving visa access and visa processes for China is the key to opening the country's doors to more International visitors. That is according to the CEO and President of WTTC, David Scowsill, who is unveiling research today which underlines the significant role which Travel & Tourism is playing in driving China's economy. The US Government shutdown would cost 300 million dollars per day, according the economic consulting firm IHS Global Insight. The figure means that about 12.5 million dollars will be lost an hour, or roughly 1.6 billion dollars a week, while the government is closed.The IHS analysis accounts only for the lost wages and productivity from the nearly 800,000 federal workers, ABC News reports. Australia has managed to salvage their pride after a humiliating Ashes loss by beating England by 49 runs in the fifth day/night deciding one day international at Southampton on Monday to win the five-match series 2-1. Asia Society Korea Center will host a special lecture titled “Strategy is Innovation” by Dr. Vijay Govindarajan, on Monday, August 26th as part of the Big Thinkers/Small Dinners series. Dr. Govindarajan is the author of the New York Times and Wall Street Journal bestselling book, “Reverse Innovation.” He is widely regarded as one of the world’s leading experts on strategy and innovation and is currently the Earl C. Daum 1924 Professor of International Business at the Tuck School of Business at Dartmouth College.